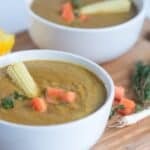 Carrot turmeric soup – A hearty winter warming, no fuss, vegan style soup that’s guaranteed to impress your friends and family. I cannot believe that the end of 2015 is near, where did all of that time go? I hope you guys are looking forward to the new year because I’m very excited about what’s to come with That Girl Cooks Healthy. I would summarise this year as being eventful my website has given me many opportunities including a few radio interviews, attending some networking events and meeting people within the same niche as myself. On another note, I am slightly disappointed with myself for not being able to prepare a few more Caribbean gluten free recipes over the Christmas period for instance a gluten free version of black cake. Well as I have already mentioned before it takes me weeks to tweak and recreate recipes and working with gluten free flour is arduous to say the least coupled with the fact that I hate mixing lots of flours together. I want the end result to be as minimally processed as possible and sadly many of these flours out there are highly refined. On the other end of the spectrum is the dense wholegrain flour to contend with. Anyway I won’t chew your ear off any further with my GF flour disaster. 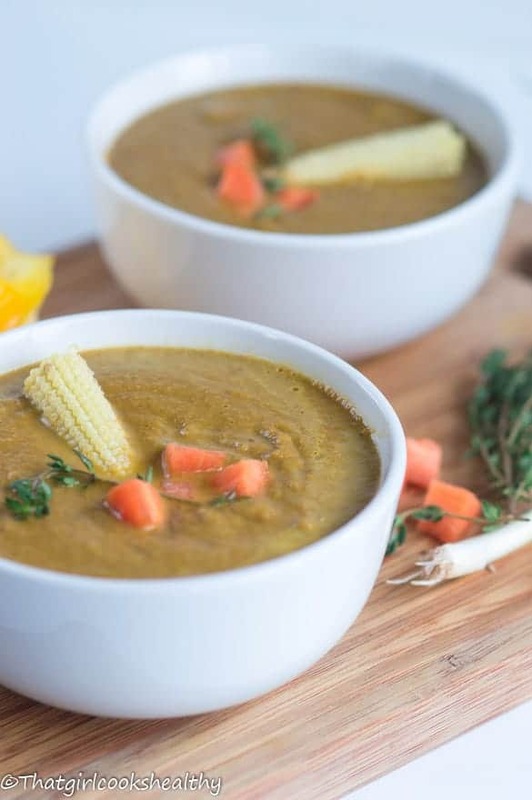 Let’s quickly move on to this carrot turmeric soup recipe – the term superfood probably springs to mind since turmeric has been recently dubbed the new power food. Well I think most of these raw fruits, veggies, fresh herbs and spices deserve to be described as a superfood since they all possess some form of health benefit. Turmeric has a very strong antioxidant compound, it’s anti-aging and is known to ward off free radicals which destroy that body’s good cells. 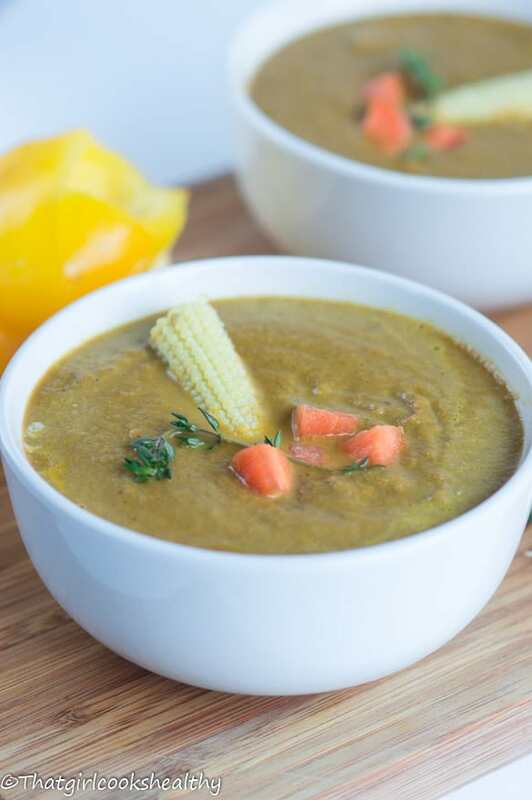 What really boosts the turmeric infused soup are the additional vegetables such as the non GMO corn, yellow bell pepper, mushrooms and of course the star of the show the carrots. 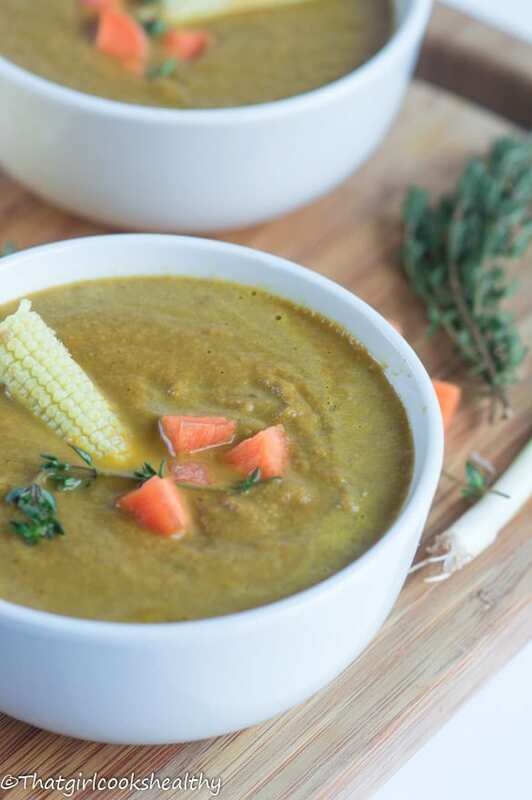 This lovely little bundle of veggies can really strengthen the immune system and that’s definitely what you’ll need to sustain good health during the cold season. I initially got the idea to make this soup from a nutritional Facebook group that I belong to, I saw a similar recipe, tried it and thought it was good but lacking something, so off I went to do some trial and error adding more herbs and spices (cloves, ginger, cinnamon, bayleaf, cumin and peppercorns) until I got a reasonable balance – a thick pureed vegetable soup with complimentary seasoning. It’s really not that hard to make this soup, in fact it takes a matter of minutes to be frank. 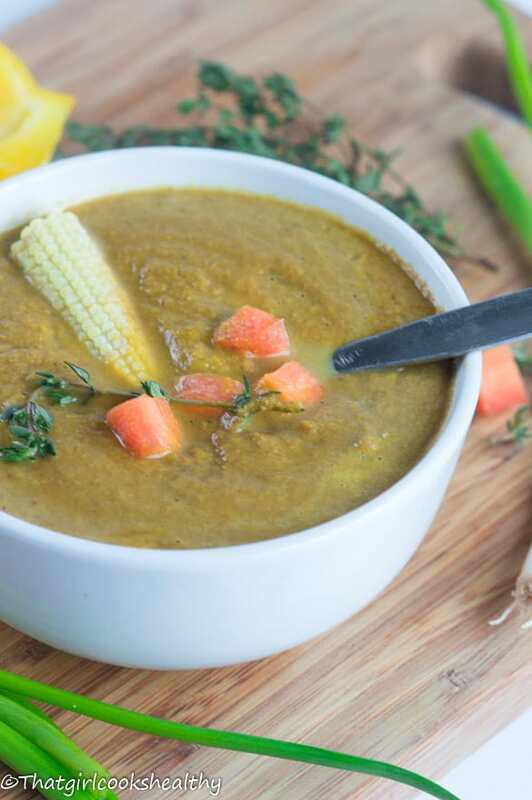 You’ll find most of the work fir the carrot turmeric soup is centered around the preparation of the vegetables. Once they are all chopped, the spices will need to be tempered before everything is tossed into the pan and pulsed in the blender. If you don’t have a blender for the carrot turmeric soup, that’s fine, just use a immersion stick blender or even a food processor will do. Heat the coconut oil on low to medium in a medium sized sauce pan then proceed to add the cinnamon stick, cloves, cumin seeds peppercorns, and bay leaf. Temper the whole spices with the bay leaf for 2-3 minutes until the aroma is released and seeds begin to crackle. Continue to temper the spices while adding the garlic and scallion. Sautee the garlic and scallion with the other ingredients for 1 minute while rotating the saucepan to prevent sticking or burning. Add the rest of the ingredients excluding the stock and coconut milk to the pan. Fold and cook the vegetables for 3-5 minutes until soft and tender. Then pour in the vegetable stock and stir. Allow to simmer for 2 minutes before pouring in the coconut milk. 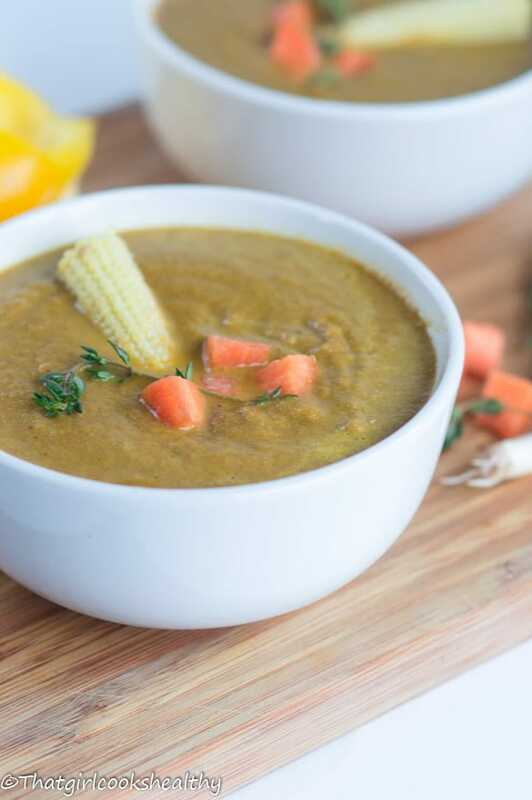 Carefully transfer the hot contents into a blender and puree into a thick soup consistency.